Robert Hart was a pioneer of Forest Gardening, but Dave Jacke and Eric Toensmeier are its eastern U.S. advocates. Together, they've created my favorite books of the year --- Edible Forest Gardens, volume 1 and volume 2, which give you the theory behind forest gardening and all of the specifics you need to create your own. Jacke and Toensmeier define an edible forest garden as a "perennial polyculture of multipurpose plants." In essence, they use an understanding of ecology to mimic the temperate forests you can find in wild places around you. But instead of letting nature take its course, they fill each niche of their forest with species that provide food for humans, nectar for beneficial insects, or enrich the soil. Each plant in the polyculture has a different growth form and different needs, so they don't actively compete for the most important resources. For example, consider growing comfrey as a thick groundcover under fruit trees. 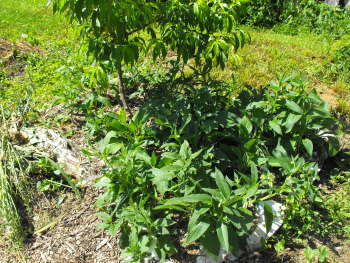 Most of our fruit trees have shallow roots that feed primarily in the top few inches of the soil, while comfrey grows taproots that delve deep into the subsoil in search of water and nutrients. Since the roots of the two species are in different parts of the soil, the comfrey and fruit tree won't compete much for nutrients, and the comfrey will actually help feed the tree when the comfrey's high quality leaves die back and rot into the surface of the soil. Meanwhile, the comfrey crowds out grass and other shallow-rooted weeds that would otherwise compete with the fruit tree. Forest gardeners talk about creating guilds --- groups of useful species that grow together without undue competition. 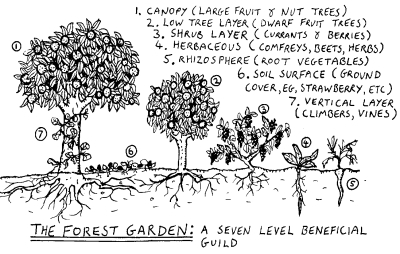 When creating guilds for your forest garden, you need to understand each species' growth form, size, root pattern, need for light, water and nutrients, and seasonal growth pattern. Then mix and match plants that seem to fill different niches, paying special attention to the most limiting resource (be that light, nutrients, or water, depending on your environment.) Check out volume two of Edible Forest Gardens for very helpful lists, or just browse through the guilds I'm starting to build in my forest garden.